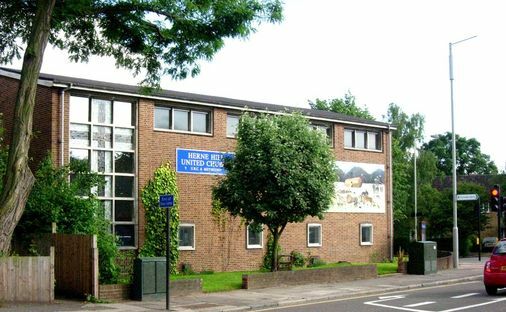 Herne Hill United Church is a lively, friendly church, blessed with a congregation of all ages and many ethnic backgrounds. Our Ministers are Revd Paul Weary and Revd David Markay. Paul and David also look after Christ Church East Dulwich and Walworth Methodist Church in Camberwell. You can leave a message for them on the office telephone 020 7738 7434. Our Junior Church leaves the morning service after the first fifteen minutes to have their own teaching and activities. 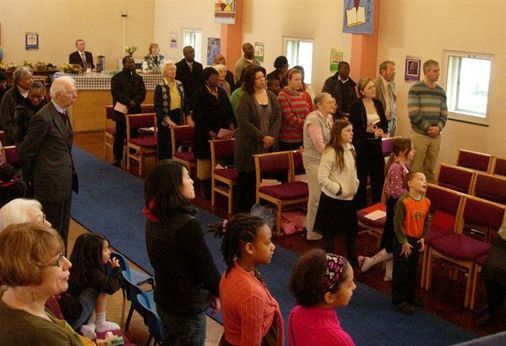 Music forms an important part of our worship every Sunday. On the third Sunday of most months we celebrate Holy Communion. Our members are involved in activities and groups to serve the community and our premises are also available to outside users. 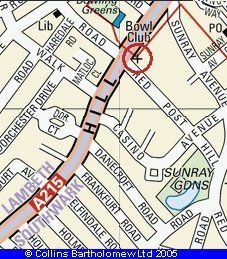 Herne Hill United Church is located at the junction of Red Post Hill with Denmark Hill (see the map to the left). Buses 68 and 468 stop on Denmark Hill near the church and the 42 and P4 stop near the church on Red Post Hill. The nearest railway stations are Herne Hill, Denmark Hill and North Dulwich. The photograph below shows the view of the church from the opposite side of Denmark Hill. The Youth Choir meets on Fridays and welcomes boys and girls aged 8 and above who enjoy singing.